What is the Age-Defying Laser? Until now, the benefits of the Age-Defying Laser could only be achieved with a series of dermatologist treatments. Visibly restore the natural luminosity of your entire face and smooth hard-to-treat wrinkles for a more youthful, radiant and refreshed look in as little as 2 weeks. Which technology does the Age-Defying Laser use? The Age-Defying Laser uses non-ablative fractional laser technology. See a video about how it works here. How does the Age-Defying Laser compare to professional salon treatments? For years, dermatologists have been using laser treatments to diminish the visible signs of ageing. 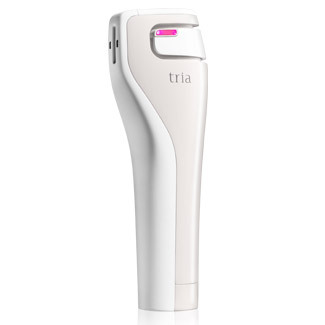 Today, Tria’s dermatologist-recommended Age-Defying Laser gives you the same professional anti-ageing results of in-office laser treatments yet in the convenience of your own home. Using the same non-ablative fractional technology previously available only through dermatologists, the Age-Defying Laser stimulates your body’s own natural renewal process to produce new collagen. 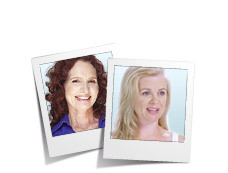 How does the Age-Defying Laser compare to the anti-ageing products that I am already using? The Age-Defying Laser uses the same non-ablative fractional laser technology previously available through dermatologists. Unlike topical products, the Age-Defying Laser emits microscopic columns of laser light to help stimulate new collagen below the skin’s surface. By using the Age-Defying Laser for several minutes a day, you can expect to see visible improvement in as few as 2 weeks. Do not use your Age-Defying Laser on your eye or eyelid or within the eye socket. Treat around the eyes only where you can feel bone underneath the skin. If you are looking to reduce wrinkles particularly in the eye area, our Age-Defying Eye Wrinkle Correcting Laser might be a good option for you. Find out more about the product here. Do not use the Age-Defying Laser to treat your eye or eyelids or aim the device directly into your eyes. Doing this could cause serious eye injury such as a permanent or temporary decrease in vision or permanent blindness. Treat around the eyes only where you can feel bone beneath the skin. Treatment time depends on the setting. Can I use the Age-Defying Laser more than once a day? 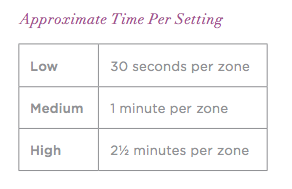 No, do not treat each zone more than once per day (once every 24 hours). Doing this could result in increased risk of skin irritation. Which treatment level should I use? To help your skin adjust, start on Low. Increase to Medium as your skin adjusts and then High for best results. As you may notice some temporary redness of the skin where you treated, treat in the evening before bedtime to allow skin renewal to begin and redness to diminish overnight. Use a cleanser to prep your skin by removing makeup, sun cream and other impurities that can interfere with the laser light. 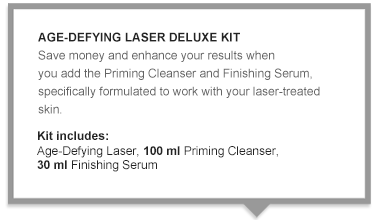 For best results we recommend using our Priming Cleanser that is especially formulated for use with laser-treated skin. You should start to see visible results like smoother skin in as few as 2 weeks, followed by fewer lines and wrinkles occurring a few weeks after the full 8-week course of treatment. You may notice some temporary redness of the skin where you treated. This is a normal reaction, which most people find diminishes over time as the skin adjusts to the treatments. Follow your laser treatment with our Finishing Serum to soothe and hydrate treated skin. Formulated to improve firmness and increase elasticity, this luxurious serum will fit perfectly into your beauty routine. Follow your laser treatment with our Finishing Serum to soothe and hydrate treated skin. Formulated to improve firmness and increase elasticity, this luxurious serum will fit perfectly into your beauty routine. I just finished my first 8 week treatment. What now? We recommend taking at least a 4-week break to allow the cellular renewal process to continue. Many consumers of the Age-Defying Laser products have chosen to continue use after this break if additional anti-ageing benefits are needed. How long should I use the Age-Defying Laser? When is the process fully complete? 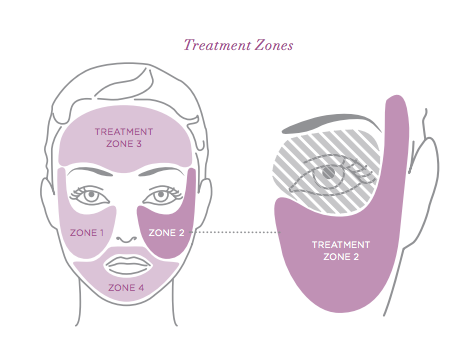 You should use your Age-Defying Laser 7 days per week for 8 weeks, with a downtime of 4 weeks. When you feel like you are ready for an additional treatment, treat for another 8 week cycle. Is the Age-Defying Laser safe for me to use? / When should I not use the Age-Defying Laser? 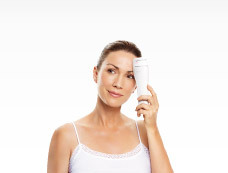 The Age-Defying Laser is appropriate for all skin types. Do not use if you are under the age of 18, and do not allow children to play with or use this device. Consult a health care professional first if you are pregnant or undergoing professional cosmetic treatments, such as a skin peel, laser resurfacing or filler injections. Also consult a health care professional if you have a significant medical skin condition, your skin is unusually sensitive, your skin easily develops a rash or allergic reaction or if you are taking a medicine, such as a steroid. The Age-Defying Laser should also not be used on skin that contains permanent makeup or is tattooed, infected, burned or cut. What are the possible side effects when using the Age-Defying Laser? During treatments, you may feel mild discomfort such as a slight warming or prickling, which many users say feels like a sunburn. These are all normal side effects and generally subside within a few minutes or hours but may continue throughout treatment. They may diminish with continued use as the skin adapts to the treatment. The Finishing Serum can help minimize these side effects. If I just saw my beautician for an anti-ageing treatment, how long should I wait before using the Age-Defying Laser? Consult a health care professional first before using the Age-Defying Laser. In all cases, wait until the redness and swelling have dissipated. Do not treat if your skin is significantly red or swollen from a previous treatment. Can I use it if I had botox treatments or fillers? The Age-Defying Laser should not be used on skin that contains permanent make-up or is tattooed. Protect your skin by applying a broad spectrum sunscreen of at least SPF 30 every morning. Daily sun protection will protect healthy skin created by your Age-Defying Laser to maintain results longer and help prevent new photo damage. During treatments, you may feel mild discomfort such as a slight warming or prickling, which many users say feels like a sunburn. Some women feel a slight stinging or warming sensation during treatment. This is normal and will diminish. To help your skin adjust, start on Low. Increase to Medium and then High for best results. Can I incorporate the Age-Defying Laser within my everyday beauty/anti-ageing regime and not use the Age-Defying Priming Cleanser and/or Age-Defying Finishing Serum? Will I see better results if using the Priming Cleanser and Finishing Serum? Yes, although we recommend using the Priming Cleanser and the Finishing Serum to maximize the full benefits of your Age-Defying Laser. The Priming Cleanser preps your skin by removing makeup, sunscreen and other impurities that can interfere with the laser light. The Finishing Serum helps soothe any temporary redness or stinging that may occur with the treatment while also hydrating and brightening skin.